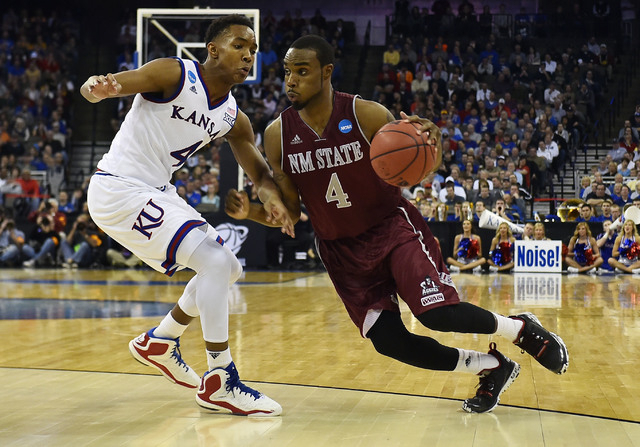 Top-seeded New Mexico State will be the only team to receive a first-round bye when the Western Athletic Conference begins its men’s basketball tournament this week at the Orleans Arena. Grand Canyon University is ineligible for postseason play until 2018 because of its transition to NCAA Division I status. That leaves the eight-team league with three quarterfinal games on Thursday. The WAC championship game is scheduled for Saturday at 8 p.m. on ESPNU. Beginning Wednesday, the WAC women’s tournament will run concurrently at Orleans Arena with the title game set for 1 p.m. Saturday. Game 1: No. 4 Utah Valley vs. No. 5 Missouri-Kansas City. 2 p.m.
Game 2: No. 2 CSU Bakersfield vs. No. 7 Chicago State, 4:30 p.m.
Game 3: No. 3 Seattle U vs. UT-Rio Grande Valley, 7 p.m.
Game 4: No. 1 New Mexico State vs. Game 1 winner, 6 p.m.
Game 5: Game 2 winner vs. Game 3 winner, 8:30 p.m.
Game 6: Semifinal winners, 8 p.m.